260 pages | 15 B/W Illus. This book explores the phenomena of the urban everyday and new urban tourism. It provides a systematic framework and draws on a mix of theoretical and empirical work to look at the increasing intermingling of ‘tourists’ and ‘residents’. Tourism and urban everyday life are deeply connected in a mutually constitutive way. Tourism has become a key momentum of urban development and affects cities beyond its economic dimension. Urban everyday life itself can turn into a matter of tourist interest for people searching for experiences off the beaten track. Even living in a city as a resident involves moments, activities and practices which could be labelled as ‘touristic’. These observations demonstrate some of the various layers in which urban tourism and everyday city life are intertwined. This book gathers multiple interdisciplinary approaches, a diversity of topics and methodological variety to examine this complex relationship. 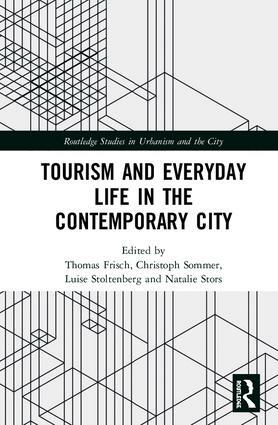 It presents a systematic framework for the dynamic research field of new urban tourism along three dimensions: the extraordinary mundane, encounters and contact zones, and urban co-production. This book will be of interest to students and researchers across fields such as Tourism and Mobility Studies, Urban Studies, Leisure Studies, Tourism Geography, and Tourism Sociology. Thomas Frisch studied sociology, English and Portuguese, andholds a Master’s degree in Sociology from the University of Salzburg. In his PhD thesis he is exploring digital review cultures, their communities, and their consequences for everyday practices. His major academic interests are tourism and media sociology, the sociology of evaluation, slum tourism and urban studies. Christoph Sommer is completing his PhD in geography at Humboldt-Universität zu Berlin. He co-founded the Urban Research Group New Urban Tourism at the Georg Simmel Center for Metropolitan Studies. His main areas of interest include research on urban policy, governance, the anthropology of policy, tourism and municipalism. Luise Stoltenberg is completing her PhD in sociology at Universität Hamburg. For her dissertation project, she is studying the online hospitality networks of Couchsurfing and Airbnb with regard to the notion of dwelling. Her research interests include the sociology of everyday life and of digital cultures, as well as mobility and tourism studies. Natalie Stors is a PhD candidate and research associate at the Department of Leisure and Tourism Geography at Trier University, Germany. In her PhD project she is investigating the motivations for participating in short-term rental practices via Airbnb and the implications of sharing platforms for the construction of tourism space. Her research is dedicated to urban tourism and the sharing economy.